Perhaps you know this famous department store from the modest cities of Milan and Rome? 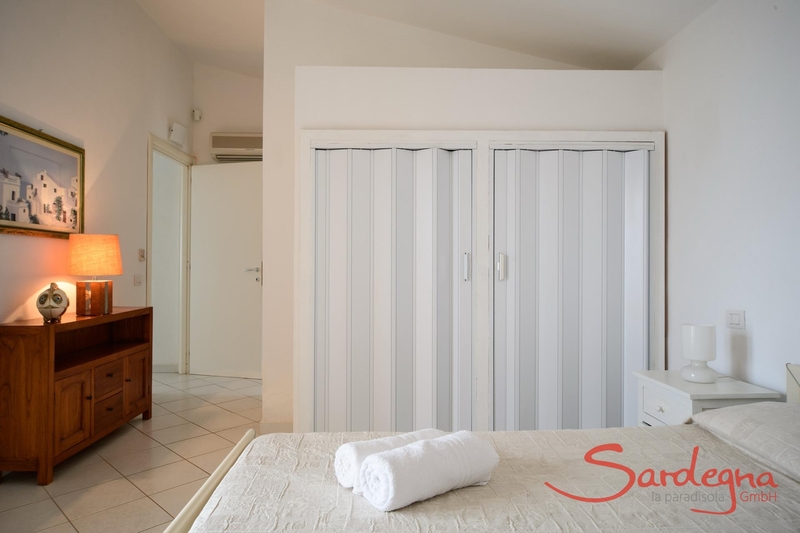 In Cagliari it extends over 6 floors of an ancient palace in the central Via Roma. Here you will find almost all famous brand names, from bags to clothing, to cosmetics and equipment. On the 6th floor, the food hall offers a fusion restaurant where you can enjoy Italian cuisine in a modern style. Aperitifs and snacks are available here with a view of the harbour, and there is bar on the ground floor. The Municipal Art Gallery is part of the beautiful city garden (Giardini Pubblici), which is on the way to the Castello district and offers great views over the city. Thanks to the Ingrao collection, it is possible to obtain a complete overview of the most important trends of Italian art in the last century. 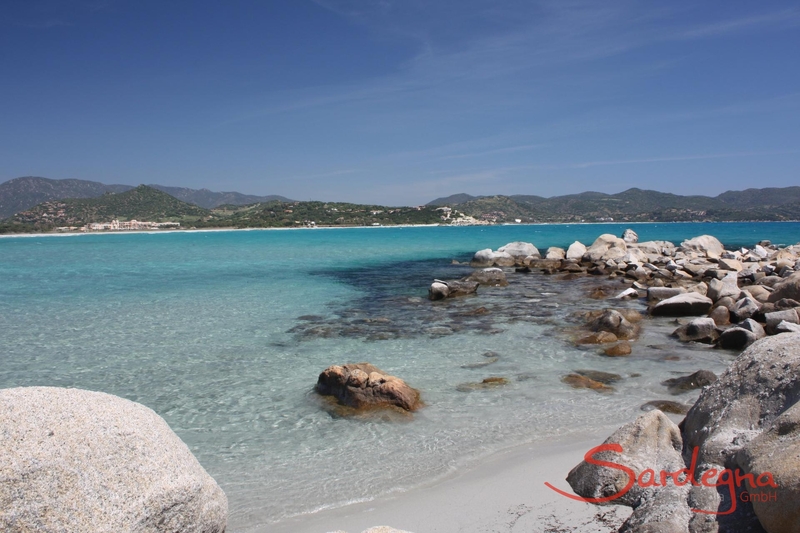 Cagliari's nearly 10 km long city beach is a rendezvous for sunbathers during the day. In the evenings, there is dancing at the endless number of beach bars found everywhere - from fiery salsa sounds to hard rock. The San Benedetto market was inaugurated in 1957 and is one of the largest European community markets. On the ground floor is the fish department, while the upper floor offers fresh fruits, vegetables, meat and other delicacies. Early in the morning (except on Sunday) is the best time to visit the market, where you can find all the gastronomic treasures Sardinia has to offer. The market and the many shops and bars around it are also a good opportunity for an Italian breakfast or a tasty snack. We recommend visiting the old town of Cagliari in the evening hours when the heat of the day has somewhat subsided. There is an exciting nightlife on the Bastione di Saint Remy: this is where the inhabitants of Cagliari meet for an aperitif with light jazz music playing in the background. The Holy Efisio crypt is situated underneath the church of the same name, Chiesa di S. Efisio in the Via S. Efisio in Stampace district, just a few hundred metres away from the centrally located Piazza Yenne. There are no fixed opening times; they are open mornings and afternoons. Just ask them to open the door to the crypt in S. Efisio church. Offering some of the best views in town, this modish Castello bar has panoramic seating on top of the city’s medieval ramparts. If the weather is being difficult, make for the brick-lined interior and order yourself an Alligator cocktail, created in honour of the hero of Massimo Carlotto’s novels. There is occasional live music. MotoZAI, in cooperation with Planet Motors, offers bicycle, scooter and motorcycle hire as well as motorcycle clothing and accessories. Everyone can find what they're looking for: experts, beginners and those who want to take an exam after receiving instruction. Their fleet offers 125, 250, 650 and 990 respectively with a wide range of models of motorcycles for all needs. The restaurant is located below the Bastione di Saint Remy at the corner of Cagliari's famous shopping boulevard, Via Garibaldi. This "cafe" is actually a restaurant where you can enjoy typical specialties in a refined, international atmosphere. This restaurant is indisputably among the best in Cagliari, if not in Sardinia. It has been awarded with a star by the Michelin Guide: Sardinian flavours are presented with imagination and offer taste and balance. For a less expensive experience, you can choose the bistro part of the "Fork" restaurant. The entrance, telephone and boss are identical, the motto of Fork is 'easy". Top restaurant in chic ambience, which is run by Signore Marino, who has a lot of experience. It offers mainly fish dishes. The menu depends on the supply and therefore changes daily. The menu is based very much on traditions from Cagliari. Restaurant characteristic of the old town with a warm, cosy atmosphere and a collection of artwork. Traditional cuisine covering the entire national territory. Here you can still dine as people did almost a hundred years ago. 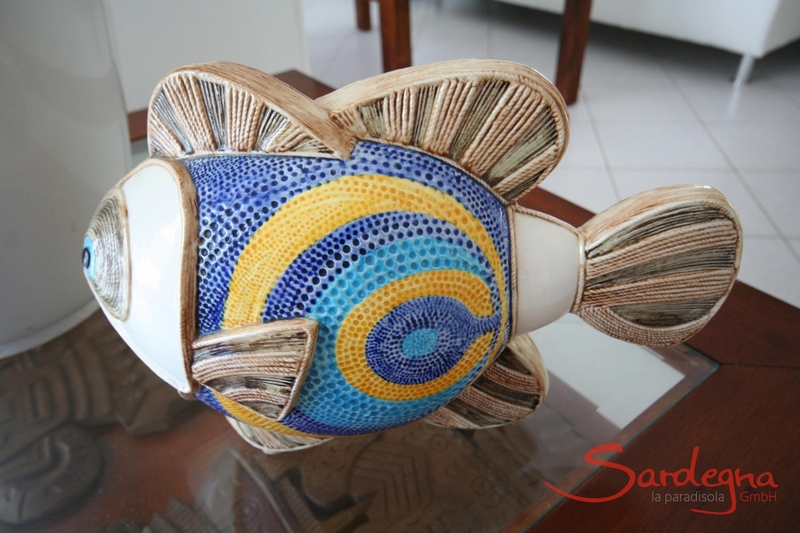 Opened in 1938, the restaurant has long tables where guests can enjoy fresh fish specialties. This restaurant offers typical Sardinian dishes and a stunning view of Cagliari. The food is served under a gazebo in the middle of the Bastion of Santa Croce. The restaurant is located in Via Santa Croce 51 between the art gallery in the Jewish quarter ("Ghetto degli Ebrei") and the Elephant Tower ("Torre dell'Elefante"). This restaurant, situated directly in the harbour quarter and over three floors, manages to have a cosy atmosphere. The cuisine fuses typical Italian dishes with more ethnic ones The stone-oven pizzas are a special treat. This rustic, Sardinian restaurant is located in the harbour area. If you search for a menu, your search will be in vain: the waiter will bring you all sorts of delicious treats. Red wine from coarse clay jugs is a must. Let them surprise you! Windplay - the spot for anyone who loves water sports. Windsurfing, kiting or surfing, for beginners or advanced - at Windplay Sardinia, everything is possible! Professional kite school in the south of Sardinia. Amidst fragrant macchia shrubs, Villa Azzurra reigns over the sea with views of the turquoise, crystal-clear water. After visiting this unique location, which is one-of-a-kind even within <?xml:namespace prefix = "st1" ns = "urn:schemas-microsoft-com:office:smarttags" />Sardinia, you'll never feel quite the same again. Wake up to the soft roar of the sea, and watch the glowing sun sink into the water as dusk creeps in. Just sixty steps down the property's private staircase and guests arrive at the water. 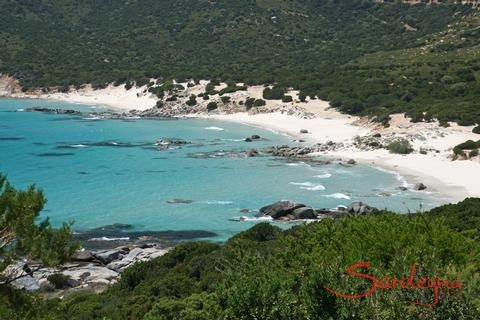 Nature lovers will fall head over heels for the tranquility and seclusion of the area, whilst never tiring of the awe-inspiring granite forms shaped by the wind and water. Even at the height of summer, Villa Azzurra's roof terrace flat, is an oasis of peace. Villa Azzurra is the summer residence of its well-travelled owners, a couple who cherish the peace and seclusion of their heavenly corner of the Earth above everything. Therefore, the flat can only be rented to adults. 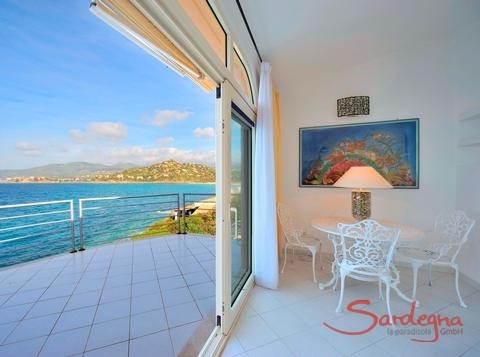 Villa Azzurra is new, modern and stylish right down to the very last detail. 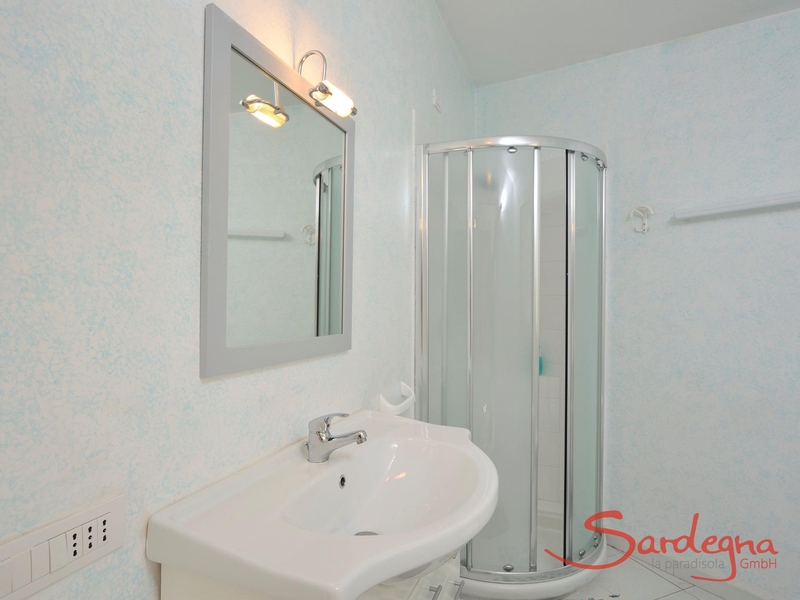 The flair and atmosphere of this gem guarantee that you feel at home as soon as you open the front door. One of the highlights of the house is a room-high, mirrored wall in the living room, which reflects the gradually-changing blue tones of the sea as the day goes by. In addition to a living room, the roof terrace flat features a dining room, two bedrooms, two modern bathrooms with showers, and a fully-equipped kitchen with a dishwasher, a washing machine and an oven. All of the rooms have air conditioning. A private car park is situated in front of the house. The plot is fenced and has private beach access. With a terrace in front of the living room and bedroom, the outdoor area is equally as fascinating as the indoor space and invites guests to while away the hours. A lower terrace in the garden, which can be reached from the private path, beckons you to lie back in the sun, or enjoy a barbecue evening around the wonderfully rustic grill. A few more steps downwards lead to the bathing area complete with platform, from which you can dive into the waves of the Mediterranean. On a clear day, the shadowy outlines of the mountains along the Gulf of Cagliarican be made out. 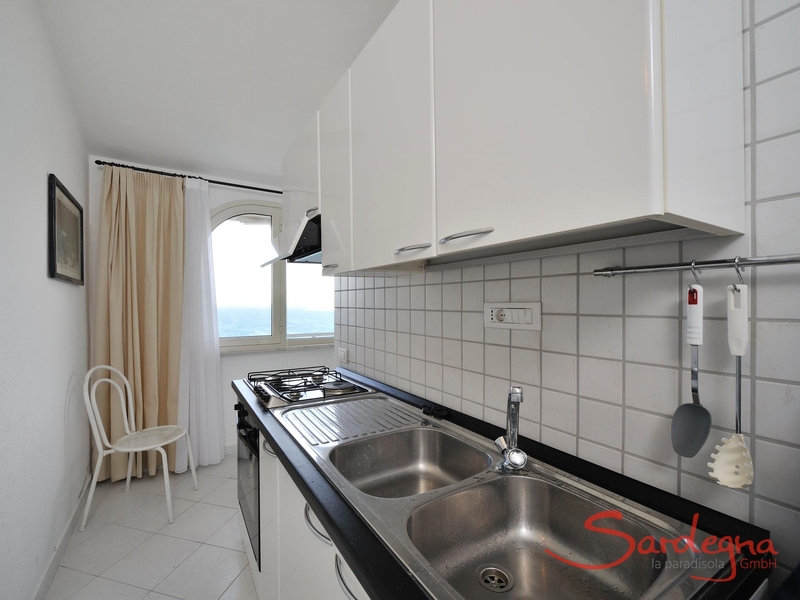 Enjoy the video of the apartment Azzurra! A special attraction of Torre delle Stelle is the close-by town of Cagliariwith its markets, romantic trattorias and restaurants. An array of fascinating sights can be found in the Castello area in the medieval old town. Along the marina and the picturesque harbor district on Via Roma, a plethora of bars, boutiques and culinary attractions await. For everyday groceries, Torre delle Stelle has a diverse range of products in Palmirasupermarket, just around the corner. Two nearby restaurants are open all year round. 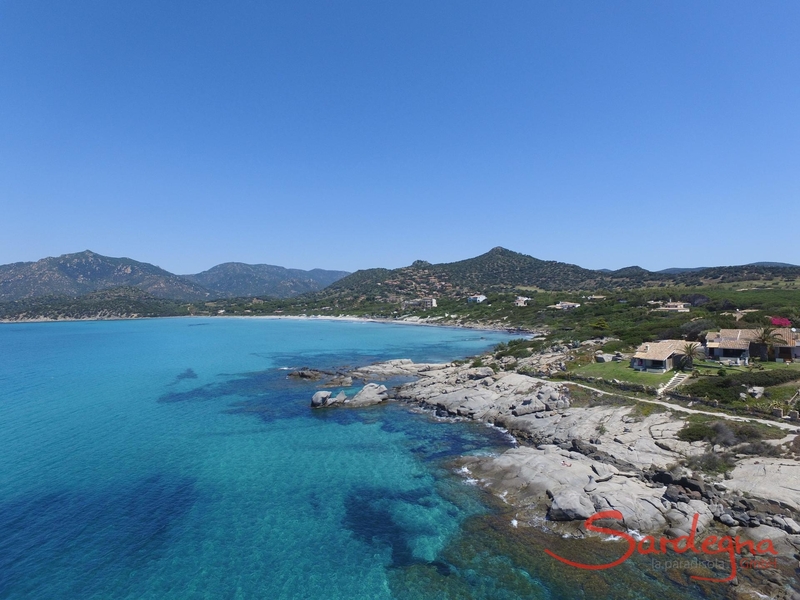 Torre delle Stelle also boasts a world-renowned diving centre. A never-ending selection of sandy beaches -- amongst the most beautiful in Sardinia - is just a few minutes' drive away. 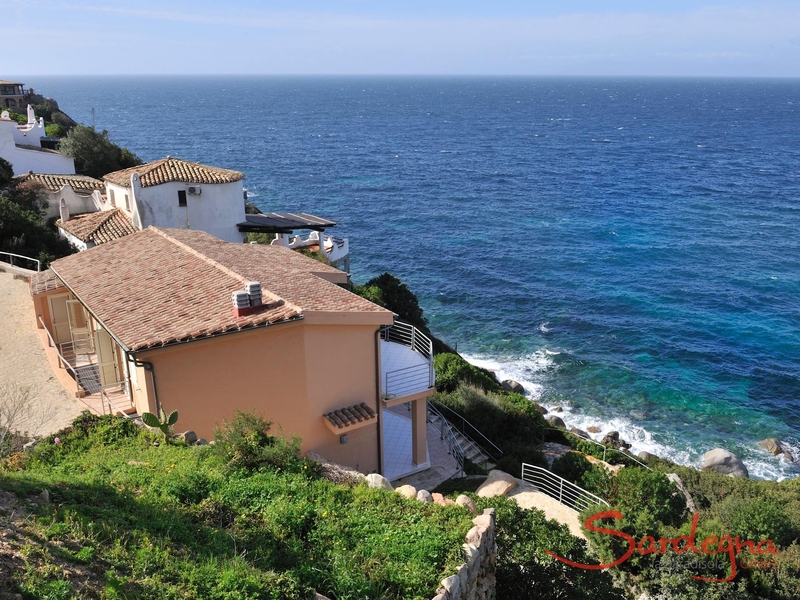 Villa Azzurra - a breathtaking sea viewAmidst fragrant macchia shrubs, Villa Azzurra reigns over the sea with views of the turquoise, crystal-clear water. After visiting this unique location, which is one-of-a-kind even within Sardinia, you'll never feel quite the same again. Wake up to the soft roar of the sea, and watch the glowing sun sink into the water as dusk creeps in. Just sixty steps down the property's private staircase and guests arrive at the water. Nature lovers will fall head over heels for the tranquility and seclusion of the area, whilst never tiring of the awe-inspiring granite forms shaped by the wind and water. Even at the height of summer, Villa Azzurra's roof terrace flat, is an oasis of peace. 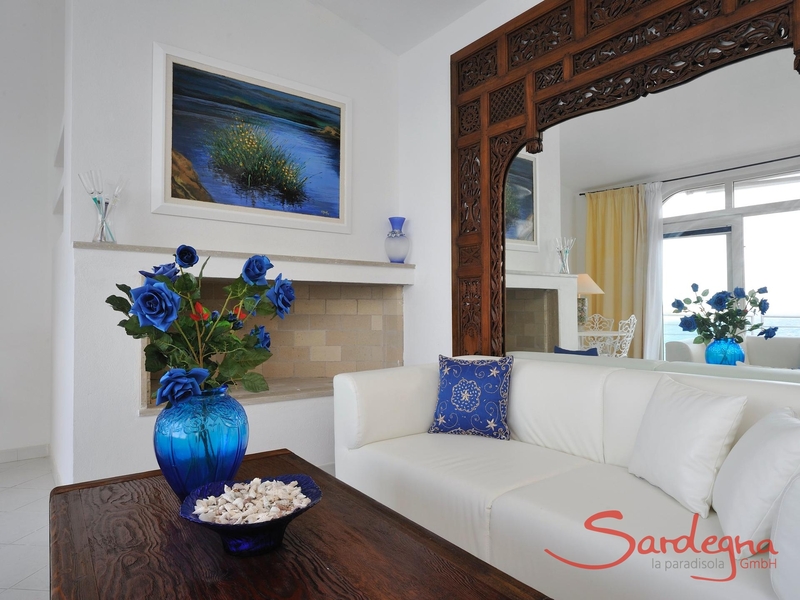 White and blue - the sea in your living roomVilla Azzurra is the summer residence of its well-travelled owners, a couple who cherish the peace and seclusion of their heavenly corner of the Earth above everything. Therefore, the flat can only be rented to adults. 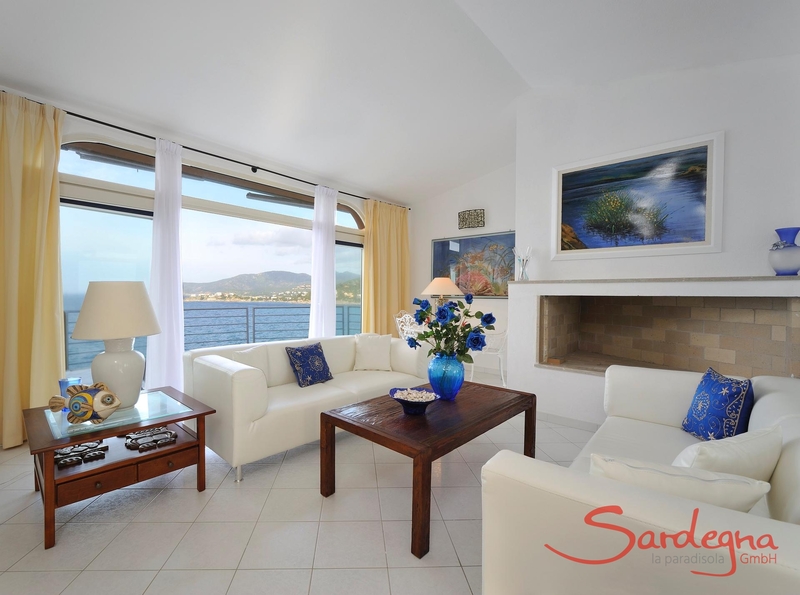 Villa Azzurra is new, modern and stylish right down to the very last detail. The flair and atmosphere of this gem guarantee that you feel at home as soon as you open the front door. One of the highlights of the house is a room-high, mirrored wall in the living room, which reflects the gradually-changing blue tones of the sea as the day goes by. 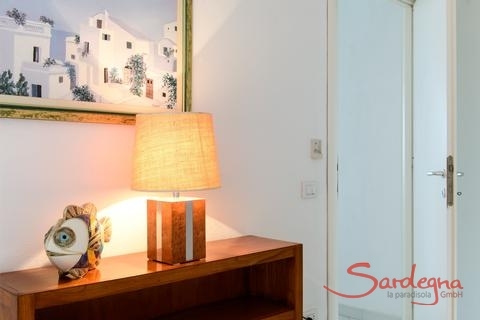 In addition to a living room, the roof terrace flat features a dining room, two bedrooms, two modern bathrooms with showers, and a fully-equipped kitchen with a dishwasher, a washing machine and an oven. 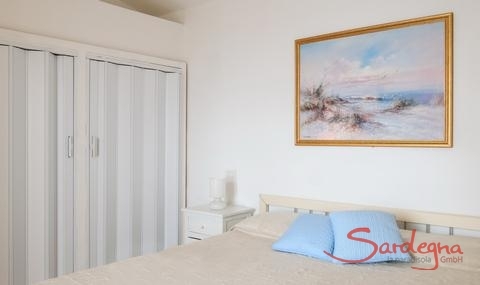 All of the rooms have air conditioning. A private car park is situated in front of the house. The plot is fenced and has private beach access. With a terrace in front of the living room and bedroom, the outdoor area is equally as fascinating as the indoor space and invites guests to while away the hours. A lower terrace in the garden, which can be reached from the private path, beckons you to lie back in the sun, or enjoy a barbecue evening around the wonderfully rustic grill. A few more steps downwards lead to the bathing area complete with platform, from which you can dive into the waves of the Mediterranean. On a clear day, the shadowy outlines of the mountains along the Gulf of Cagliarican be made out. 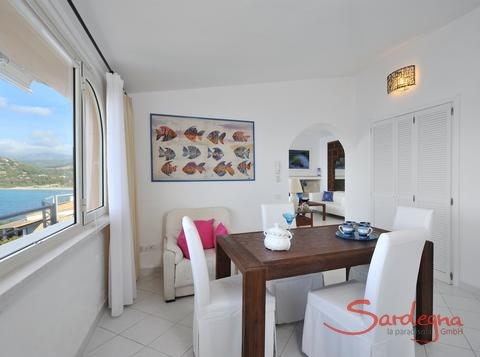 Enjoy the video of the apartment Azzurra! Markets, people and cultureA special attraction of Torre delle Stelle is the close-by town of Cagliariwith its markets, romantic trattorias and restaurants. An array of fascinating sights can be found in the Castello area in the medieval old town. Along the marina and the picturesque harbor district on Via Roma, a plethora of bars, boutiques and culinary attractions await. For everyday groceries, Torre delle Stelle has a diverse range of products in Palmirasupermarket, just around the corner. Two nearby restaurants are open all year round. 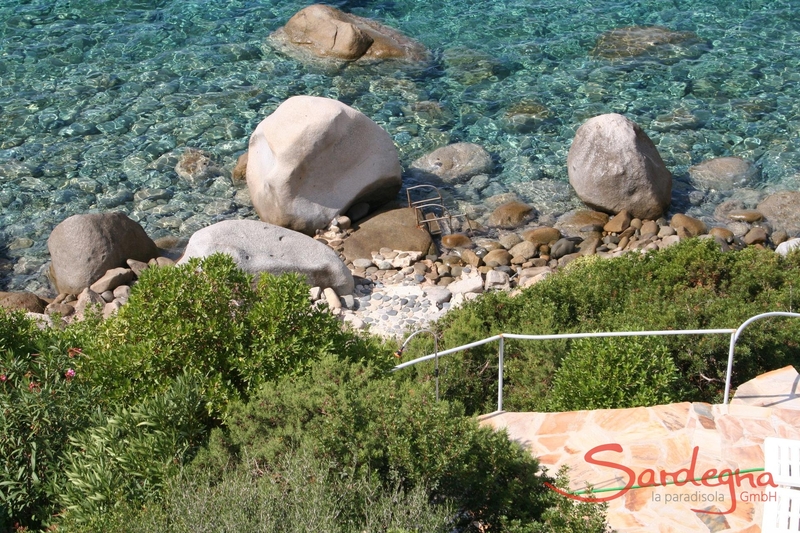 Torre delle Stelle also boasts a world-renowned diving centre. 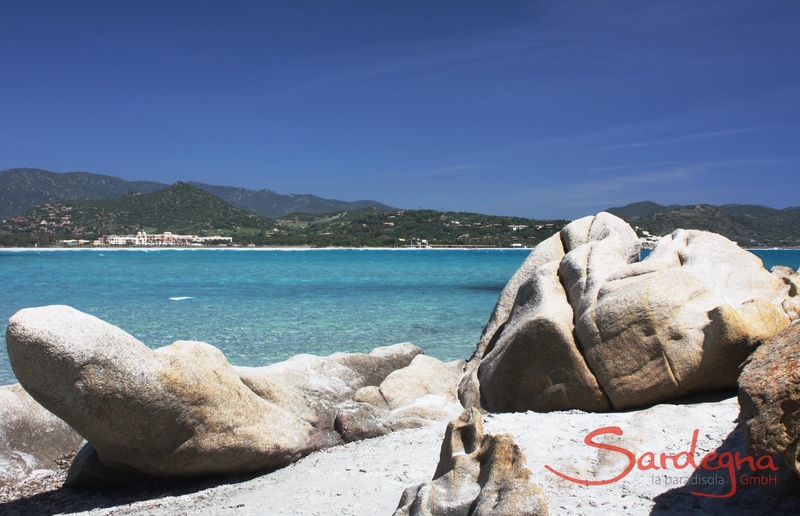 A never-ending selection of sandy beaches -- amongst the most beautiful in Sardinia - is just a few minutes' drive away. 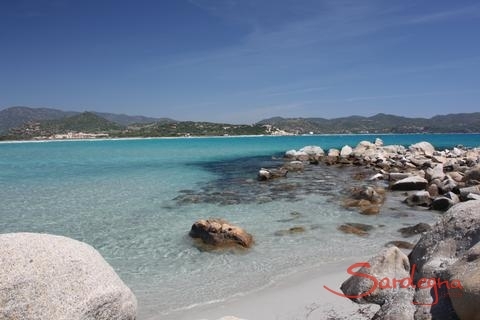 Villa Bella is pure Sardinia: The holiday home is situated in a gentle hilly landscape, surrounded by wild macchia. From the terraces you have a great view of the sea and the sunset. 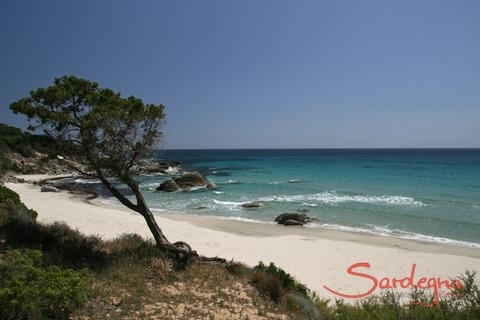 Its own small cove is just outside the door; the nearest sandy beach is only one kilometre away. Book now! Villa delle Stelle is a spacious home, unpretentious, it impresses with its secluded position on a tip of land offering privacy as well as breathtaking views of the sea: you are right between the sky and the sea.